Wittmann Battenfeld UK Managing Director, Barry Hill, says that last autumn’s Fakuma exhibition provided much evidence of the same – both in terms of plant and factory investments and in new ranges of equipment. Much of the development in Wittmann materials handling development technology, says Hill, is due to the bespoke and custom-built nature of the company’s production plant for equpiment – including sheet metal production. This has been located in Wolkersdorf, Lower Austria since 2015. ‘Our bespoke climate chamber facility at Wolkersdorf, for example, ensures that our dry air dryers are exposed to extreme conditions and therefore guarantee the Wittmann name and reliability worldwide,’ says Hill. Right from the planning stage of the Wolkersdorf production plant, the climate chamber was included in the design. It offers a room completely insulated from the outside world and equipped with an ultra-modern air conditioning system, which is able to simulate an extremely wide range of ambient climatic conditions. All Wittmann dryers are exposed to a great variety of ambient conditions: The test results are recorded using the OPC protocol and included in relevant documentations, from which the locally required adaptations can be derived in each case. For example, if a materials dryer operating in Europe or North America is able to reach an excellent dew point value with standard equipment and in standard operation, specific adaptations still need to be made to reach a comparable result under tropical conditions. The Wittmann Aton segmented wheel dryer, for example, was optimized for drying performance and energy efficiency with the help of tests carried out in the climate chamber. Wittmann dryers have the option to have the actual dew point shown on their display – unlike various products from competitors, which only display the set target value. The Aton Plus, for example, was developed there and arrived just in time for the Fakuma show in October 2018. This segmented wheel dryer now comes in a new design and is equipped with a new user interface. The new touch display of the Aton Plus enables the operator to get an overview of all drying parameters via an easy operation of its graphical menu. Using the touch display, the latest-generation Wittmann Feedmax S3 net material loaders can also be visualized and controlled. Frequent climbing onto the processing machine has thus become history, which constitutes a substantial improvement in operational safety. Dryers from the Aton plus and Aton basic series are available in several different sizes. They can be supplied with dry air capacities of 30 m³/h, 70 m³/h or 120 m³/h for material throughput rates of up to about 70 kg/h. At the Fakuma 2014, the models Aton plus F120 with two drying silos and Aton basic F70 as a mobile variant will be on display. The Wittmann Group also used the Fakuma event to launch the Gravimax G56 – a new gravimetric materials blender for mixing up to six different components. In spite of its large blending capacity this appliance is absolutely on a par with the highly successful smaller models from WITTMANN in terms of mechanical attributes, control system, easy access and process reliability. Dosing is affected by pneumatically operated, wear-resistant metering valves. The cylinders which operate the valves are located outside the material flow, which prevents the material from bridging and facilitates cleaning substantially. The special RTLS (Real Time Live Scale) weighing unit determines how often and for how long every metering valve must be activated. With this method, a metering accuracy of ±1% can be achieved. The performance features of the new Tempro basic C120 series guarantee a trouble-free, optimal production run wherever high cooling capacities and large displacement volumes are required. 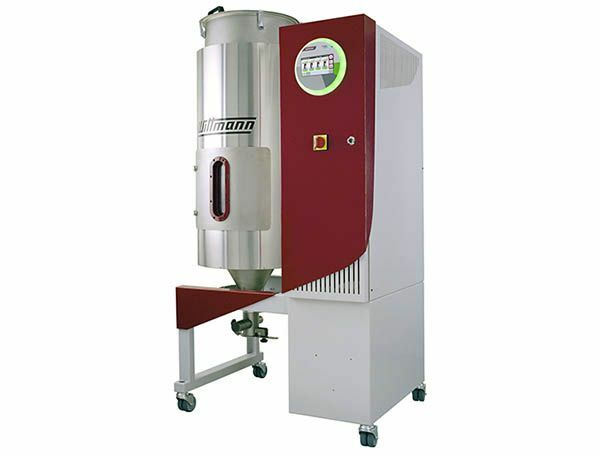 Using the largest model of this series, customers can heat moulds weighing up to 10 tons to the desired operating temperature within a very short time. Regulation of the flow volume passing through the individual mould channels is gaining increasingly in significance. More than half of all WITTMANN temperature controllers sold are now equipped with a flow regulation device – a good reason to raise the maximum temperature limit from 160° to 180°C with the introduction of the new measuring device. However, this new measuring device offers not only an extension of the temperature range, but also the possibility to measure flow rates below 2 l/min with extreme accuracy. This, in turn, enables optimal monitoring of mould channels with extremely narrow cross-sections. Users often divide the quantity of water per temperature control circuit into two water circuits by installing an external Y fitting, to provide the option of connecting two or more cooling channels parallel to each other. This type of parallel connection reduces the pump’s operating pressure and thus increases its displacement volume.